The price has been REDUCED on the Pro Modified HD Drag Bike for sale. 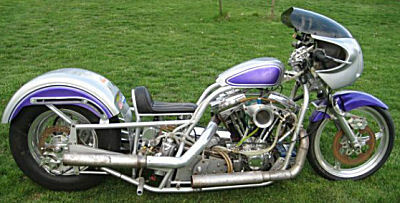 The motorcycle has a Chromoly frame, 119 ci Harley Davidson motor in the bike and around 200 horsepower. It runs in mid 8's in the 1/4 mile and weighs around 400 pounds. I have all of the information on the motor, etc. I also have a spare motor for sale if you're interested. I have owned the Pro Modified Harley drag bike over 12+ years and it's in EXCELLENT condition. I used to race motorcycyles but retired after having kids.
. If you would like to write a review or voice any opinions on the drag bike for sale, you may use the comments form below this ad to do so. Thanks for visiting GoGoCycles Used Motorcycles for Sale and for taking a look at my HD Drag Bike Pro Modified . My location is in the Winchester area and in my opinion my reduced asking price is cheap enough that it can't be beat on Craigslist or in an Ebay auction; $17500 or I might take trades if you have the right vehicle. If you want to take a look or have questions regarding this great drag bike, contact me for more details and don't forget to mention that you found this ad on GoGoCycles Used Motorcycles and Parts for Sale www.gogocycles.com. I MUST SELL because I have a sick family member who is in need of an MRI. I DO NOT NEED HELP WITH SELLING THIS BIKE, SO DO NOT CALL to ASK!